Car prices in Thailand are higher than in most western countries. 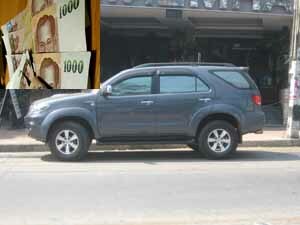 If you are from the U.S you will be amazed how expensive used cars are in Thailand compared to the prices in the U.S. The high prices of cars makes people who want to live in Thailand wonder if it would be a good idea to simply ship your car over. Generally it is not a good idea since the luxury tax on imported cars can be between 200-300% plus the cost of shipping. Also don't forget that traffic drives on the left in Thailand which means the steering wheel would be on the opposite side. What's More...Can You Even Own a Car? If you are a non-resident foreigner in the Kingdom of Thailand you can not legally own a car. Some people are able to buy and register a vehicle in their name by simply taking a rental agreement or prove of residency and get it certified at the local immigration office. If you are a shareholder in a Thai/foreign company then the company will buy the car and get it registered. Another alternative is to buy a car in another part of South East Asia and drive into Thailand. A potential place to buy one would be in Cambodia or Malaysia. In fact in Cambodia you can buy a low-end car. Then you can have an Auto shop there transform it to look like something more high-end. The price for that that could be a 5,000 to 10,000 US dollars. Or you could also buy a nice scooter or motorbike instead. You can find some second hand ones from foreigners who would be more willing to work with you on things. You could also buy one from the nearby countries and drive it in. A friend of mine did that hassle-free. You could also just rent a car and negotiate the lease for longer stays. In any case - be sure you know how the driving works in this country as you'd want to stay as safe as possible. The other drivers might not share the same opinion!